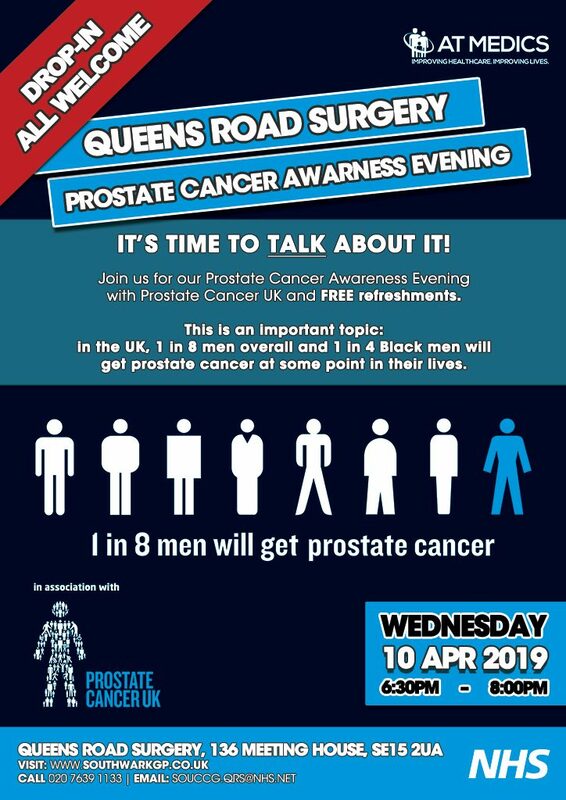 Join us for our Prostate Cancer Awareness Evening with Prostate Cancer UK on Wednesday 10th April 2019 from 6.30pm to 8.00pm at Queens Road Surgery. No registration required, simply drop-in, all local residents welcome. FREE refreshments will be provided and a chance to speak with representatives from Prostate Cancer UK and the Queens Road Surgery team. This is an important topic. In the UK, 1 in 8 men overall and 1 in 4 Black men will get prostate cancer at some point in their lives.